Rep. Alexandria Ocasio-Cortez ramped up the rhetoric in her push for a Green New Deal, describing it as a “life and death” issue. The star freshman Democrat fired off a series of tweets Tuesday night about her controversial proposal. “Don’t mess with our future. When it comes to climate, it’s all our lives at stake. The younger you are, the more consequences you’ll see. It’s life and death for us. And we will fight like it,” she tweeted. The New York Democrat also attacked the GOP for allegedly ‘doing nothing to stop’ climate change, before turning up the heat on Republicans she accused of trying to sow doubt on the issue. “They knew early… Do you really think these increasingly regular & horrific wildfires & droughts are a coincidence? That growing regularity of ‘100-year floods’ is an accident? 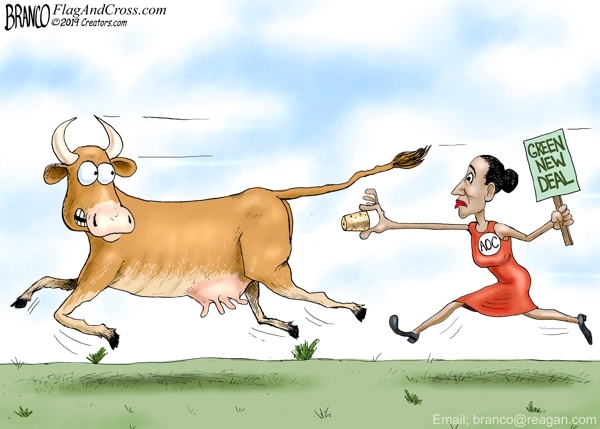 The rising democratic socialist star’s remarks came after Arkansas Republican Sen. Tom Cotton blasted the Green New Deal plan and said the media were “complicit” in burying the most radical parts of the deal. Cotton, a staunch Republican, appeared on “The Hugh Hewitt Show” on Tuesday and discussed the Green New Deal that aims to implement sweeping changes across the nation. But he claimed the media became complicit in hiding a now-infamous FAQ document circulated by the Ocasio-Cortez office, which included lines such as promising a job to “all people of the United States” – including those “unwilling to work” – and making air travel obsolete.